The player fights the famous "bruiser brother" barons of Hell in E1M8: Phobos Anomaly. The baron of Hell is an enemy monster which resembles a minotaur, faun or satyr with a pink torso, brown goat legs, and a skeletal face. A pair of barons, referred to internally by id Software as the "bruiser brothers," star as the bosses at the end of Knee-Deep in the Dead, the first episode of Doom. Barons also appear as regular enemies in the later episodes and in the sequels; coincidentally, they and their weaker counterparts the Hell knights frequently appear in pairs. They are described in the Doom instruction manual as such: "Tough as a dump truck and nearly as big, these Goliaths are the worst things on two legs since Tyrannosaurus rex." The Doom II manual later described them as follows: "The Hell Knight was bad news but this is Big Daddy. These bruisers are a lot like Hell Knights, but look a little different and are twice as tough to kill." The original baron description was given to the Hell knight in Doom II's instruction manual. A baron will utter a loud, trumpeting bull-like cry when it spots a player. With 1000 hit points, barons are the most resilient of all creatures in Doom save for the cyberdemon and the spiderdemon. They attack opponents by scratching when close or by throwing green comet-like fireballs when distant. Baron attacks are dodged easily if the player is giving him full attention, but his slime balls are faster than those of imps or cacodemons and can do very heavy damage on a successful hit. Because barons take very heavy beatings before going down, and because their pain chance is low, use of the rocket launcher, plasma rifle, or super shotgun is recommended. However, provided that the player can get at sufficient range without being hit, the chaingun and shotgun will also work, but may take a while. Melee attacks against them are hazardous, as they put the player at risk of being clawed. To kill them requires about 5 rockets, 45 plasma shots, 100 bullets, 11 seconds with the chainsaw, 15 well-placed shotgun blasts, or 5 point-blank super shotgun blasts. The BFG9000's main plasma ball does not deal enough damage to kill a baron in one shot, although the subsequent blast rays may deal a killing blow to the baron if enough of them strike the target. This is best achieved by firing the BFG at point-blank range, which leaves the player vulnerable to the baron's extremely damaging melee attack during the BFG's charge cycle. When killed, a baron will make a high-pitched gurgling sound as its body splits in half, exposing copious amounts of green blood and intestines. They excel at monster infighting because of their amount of health and damaging attacks, and their status is only rivaled by the cyberdemon and spiderdemon. Despite their endurance, barons of Hell often pose a lesser immediate threat than some of the weaker monsters because they make a single attack without special effects and, given sufficient space, their fireballs are not too hard to dodge (especially by circlestrafing). In confined spaces, however, they are hard to move around and can be more lethal. 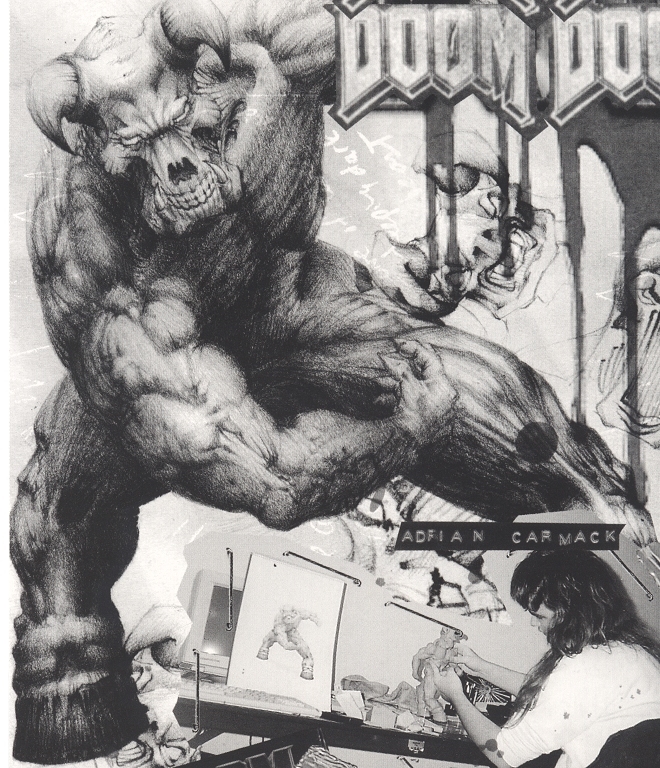 The barons were originally conceived as the "bruiser brothers" by Tom Hall, and described in the Doom Bible as the twin demons that rip the player's friend in half at the end of episode 1, with their sprites having the name BOSS as early as the Doom Technology Preview alpha to reflect this fact. It is believed that the name is meant to be a parody of the Hammer Brothers in Super Mario Brothers. Having many hit points, the baron of Hell appears only sparingly in Doom, as a boss or a champion-type monster. In Doom II the game dynamics change with the inclusion of a greater variety of relatively tough monsters, and the addition of two items, the super shotgun, and the megasphere. The Hell knight, essentially the same as the baron but with only half as much health, was added to serve as a standard medium-strength monster, falling more quickly to small arms fire such as from the shotgun or chaingun, or offering some resistance without slowing the action down, against more heavily equipped players. Barons have green blood, as is evident in their death animation, and the wall textures of the "crucified" baron. However, due to the limitations of the Doom engine, red blood is still displayed while shooting them, as with all other enemies. The face of the baron of Hell (and the Hell knight by extension) is displayed periodically throughout the games in the textures MARBFAC3 & MARBFAC4. The thing name assigned to them within the Doom source code is MT_BRUISER. The Hell knight and baron use the same projectile for their attacks. A special case in the code that inflicts damage from projectiles treats knights and barons as the same species, so no damage is inflicted and the enemies will not infight with each other as a result. However, this is not the case in PlayStation Doom or Doom 64. Not only does the baron fire a different red fireball as compared to the Hell knight's green projectile in Doom 64, but the special case is also missing. As a result, knights and barons will infight in these versions. This happened as a result of the special case not being adapted when code from Doom II was brought into the Jaguar Doom codebase for the PlayStation port. These tables assume that all calls to P_Random for damage, pain chance, blood splats, impact animations, and backfire checks are consecutive. In real play, this is never the case: counterattacks and AI pathfinding must be handled, and of course the map may contain additional moving monsters and other randomized phenomena (such as flickering lights). Any resulting errors are probably toward the single-shot average, as they introduce noise into the correlation between the indices of "consecutive" calls. Hardcoded exception to infighting negates damage (excepting indirect damage caused by exploding barrels). The baron of Hell in Doom 64 is given a red-orange colour scheme, rather than green, which is instead used for the Hell knight. In Doom 64 barons can also injure and infight Hell knights and vice versa. As in the original, the Hell knight is not as powerful as the baron, though both are more powerful than the new "ogre" variation. This class of monster is especially weak against attacks from shotguns.